Narrated by Rev. Prof. Todd Jay Leonard, the Camp Historian and Archivist, and produced and directed by Shingo Ono of Ono Creative Design, the above video and DVD offers viewers a glimpse into the long history of the IAOS and Camp Chesterfield, detailing historically remarkable religious displays sprinkled with an abundance of natural beauty that is a part of its unique topography, harmoniously, if not effortlessly fused with the architecturally significant structures and buildings that are of great historic value to this Hoosier landmark. Come take a Tour of Camp Chesterfield: Close-Up! 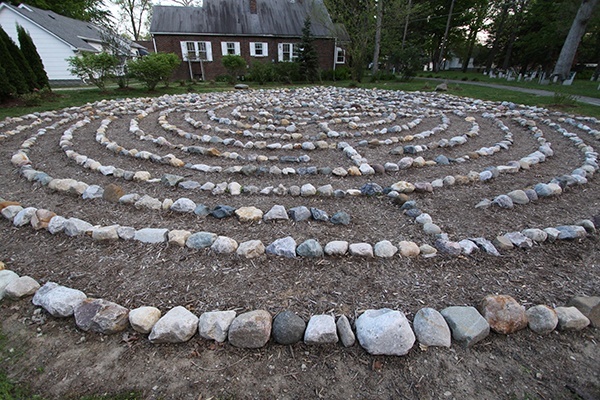 Take a look around Camp Chesterfield’s grounds. Information was pulled and cleaned out of the IAOS’ extensive archives–Vintage Camp Chesterfield. In the beautiful setting of Camp Chesterfield nestles one of the most marvelous tributes to the religions of the world that has ever been erected. The first awe inspiring spectacle that greets the eye of the visitor is the gigantic stone fountain, beautifully illuminated with multi-colored neon lights, spraying thousands of gallons of water skyward every hour. During my visit to Camp Chesterfield in the summer of 1961, I attended a séance at Mable Riffle’s home where both Mable Riffle and Mamie Shultz-Brown were the attending mediums. During the séance I was asked by my Indian Guide, Tinkletoe, if I would make the effort to obtain a totem pole for Camp Chesterfield. I immediately rose to the occasion and upon returning home [to Canada] began the process. 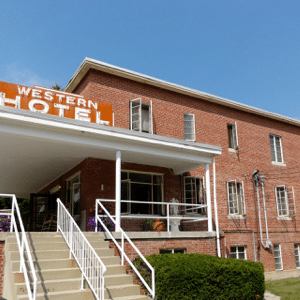 The Western Hotel is open all year and offers private baths in all rooms except the dorm facilities. Built in 1945, the Western Hotel was designed after the typical “roadside inns” of the era. Equipped with a period lobby and art-deco check-in counter, it has two floors featuring both single and twin rooms with baths; the basement houses a large and spacious women’s dormitory that allows for communal accommodations, and a smaller men’s dormitory. This hotel boasts being the first fire-proof building in the state of Indiana. The Hett Art Gallery and Museum was dedicated in 1954. Its mission is the preservation and display of art and artifacts of the Modern Spiritualist Movement. Open to all visitors at the Hett Art Gallery and Museum is the Mother Cabrini Meditation Room. The Hett Gallery classrooms are utilized for lecture series and seminary classes focused on metaphysical and spiritual content. The facility houses in three main galleries the most extensive collection of its kind. 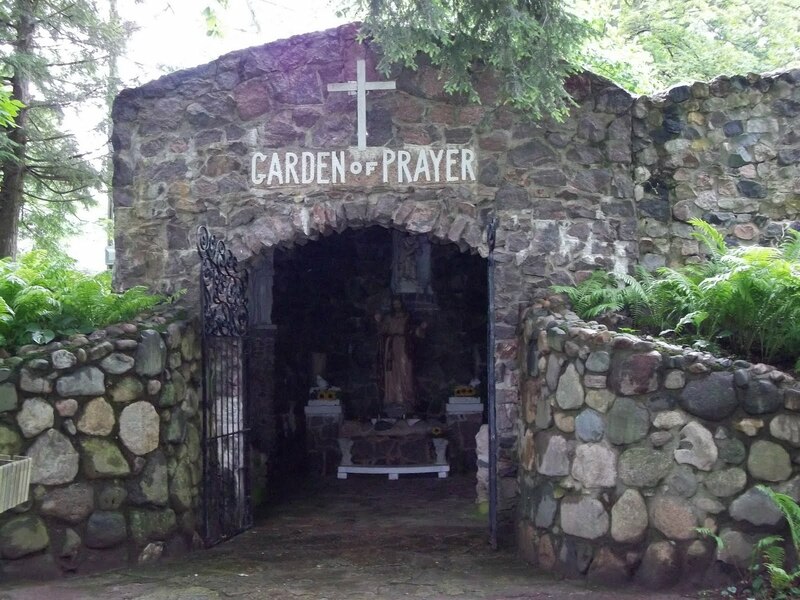 The Garden of Prayer and Sentinel Angel: Unique to the state of Indiana, the “Garden of Prayer” is a prime architectural example of a European-style grotto that was established as a site for spiritual meditation and religious devotion. Consisting of two rooms, it is equipped with altars and statues of Jesus Christ where devotees pray and light devotion candles. In 1940, the Sentinel Angel was placed outside the entrance of the Garden of Prayer as a memorial to the Mack Family. 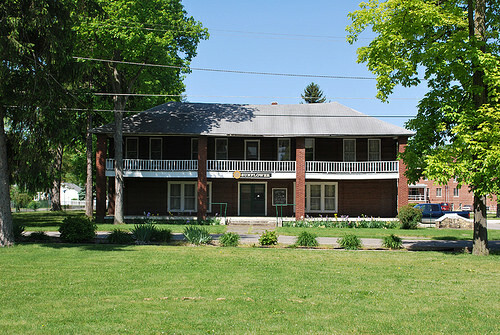 The Sunflower Hotel was built in 1914 to help keep pace with the ever increasing number of people who needed lodging. The old Lodging House (located where the current Administration Building is) could not accommodate all the guests and their needs. The Sunflower Hotel was considered to be a “modern” hotel, equipped with 70 rooms, at a cost of $6,887.70 (roughly equivalent to $160,000 today). Between the years 1922-1924, the Sunflower expanded with the addition of 40 more rooms; more modern plumbing was installed; and a section of the former Lodging House was moved and added to the north side of the hotel. Always fully-booked during high season, the Sunflower Hotel was a “home away from home” for many generations of Spiritualists visiting Camp Chesterfield. Not in active use today, the non-profit group “Friends of Camp Chesterfield Foundation” is in the process of raising funds to begin restoration on the Sunflower with the hope of returning it to its original glory. The Cathedral of the Woods. Over the years, Camp Chesterfield has witnessed the construction of three primary structures in the same location where the current Cathedral is located. The original structure (circa 1891), the “Old Auditorium,” was initially a large tent with a raised, wooden platform for message work. 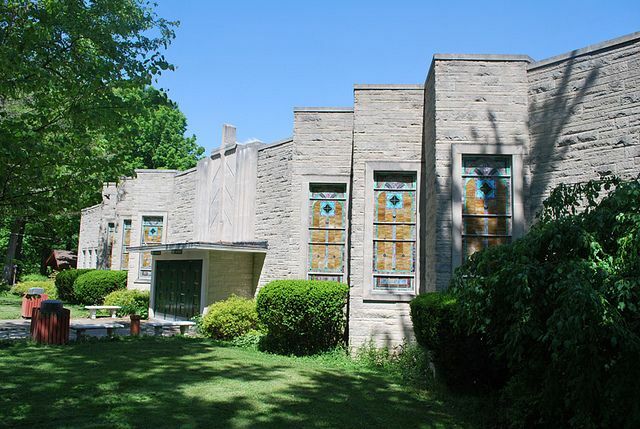 In 1903, it was replaced with a new building, which was called the “Second Auditorium.” This building stood until 1953 when it was razed to make way for the present structure, the “Cathedral of the Woods.” The Cathedral was dedicated on June 26, 1954 and is used as a venue for large gatherings. Can I come and just walk the grounds and enjoy the sights? Yes, you are welcome to come to Camp and walk the peaceful grounds. You can always check the calendar for the days you will be visiting to see if there are any scheduled events that may also interest you. Is there a fee to walk the grounds and see the sites? There is no gate fee at this time. The one exception is during our Spirit Fest Weekend in September, then there’s a fee. Is the Art Gallery & Museum open to the public? The Hett Art Gallery & Museum is open on the first Saturday of each month (during our Psychic Fairs) from 11:00 am to 2:00 pm. You can also make an appointment to have a tour with a docent by contacting our Welcome Office. I would like to learn more about Camp Chesterfield and its history, where should I start? 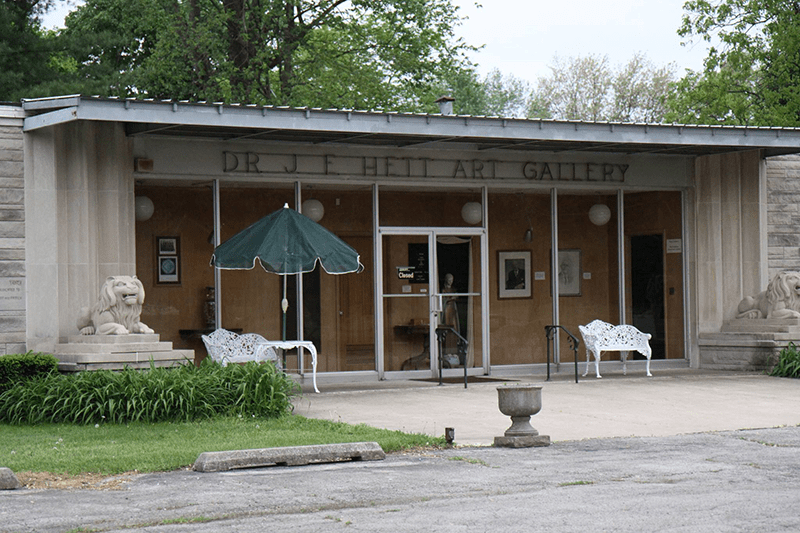 You can learn more about the history of Camp Chesterfield and Spiritualism by visiting About Us and the Hett Art Gallery & Museum pages on our website. There you will have access to historical archives as well. Camp Chesterfield is listed on the National Register of Historical Places. Can I take pictures while I am at Camp Chesterfield? You may take photos of the grounds and monument sites outside only. No pictures are allowed inside of the buildings. We do ask that you respect the privacy of the resident mediums and not take any photos of the inside of their home unless you have permission from that medium. Is the Hotel open every day? The Western Hotel is open every day for check-ins and check-out. 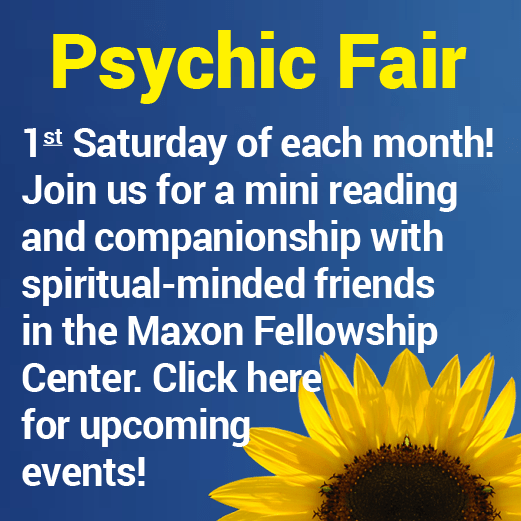 Can you recommend a Medium for a Reading? Sorry, but we do not recommend specific Mediums for private Readings. You are encouraged to go to our Mediums & Readings page, there you will find a listing of all of Camp’s Mediums. Look through the listing, see you feel drawn to. Then, contact the Medium of your choice directly by telephone or email. How do I go about scheduling a Reading? Go to our Mediums & Readings page, there you will find a listing of all of Camp’s Mediums. Look through the listing, see you feel drawn to. Then, contact the Medium of your choice directly by telephone or email. Please do not contact our main office for readings, they are always scheduled directly with the Medium of your choice. We encourage you to schedule your Reading in advance of coming to Camp. How much does it cost for a Reading? Our Price Schedule is posted, click here. Are there any suggestions for receiving a private reading? Seek a Medium’s help at a time when you are relaxed and undisturbed. Put your mind at ease. RELAX. Allow the Medium to proceed in his/her own manner. Don’t expect your first problem to be discussed at once. Have PATIENCE. Don’t try to confuse the Medium. Let him/her know when he/she is correct. BE FAIR. Skepticism, demanding proof, arguing or wanting things done a certain way only leads to failure. EXPECT GOOD. Spirit often manifests by name, but evidence comes in many other ways as well; like descriptions, relationships, simple tests, etc. BE WILLING TO VERIFY. Don’t be too quick to say no. Wait – you will soon understand. The true value of a reading is not always measured by prophecy. Prediction is always possible, but you have the free will to make changes. GUIDANCE is the keynote. Mediumship IS NOT fortune telling. A good reading will explain the philosophy of right living. EXPECT TRUTH. Don’t try to prolong a reading. The Medium realizes when spirit is gone. Are all the homes at Camp Chesterfield privately owned? The vast majority of homes on our grounds are private residences. The Indiana Association of Spiritualists as an organization owns a few of the homes as well.